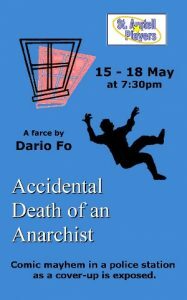 All is quiet in the Police Station where the anarchist died – till the Maniac arrives and turns everyone’s world upside down. Is she a madwoman, a police inspector, a judge, a forensics expert or even a bishop? How did the anarchist die and what is a raptus anyway? Was it suicide, was he pushed; maybe it was just an unfortunate accident. It all depends which version you take. Has she come to help the hapless officers out of the mess they’re in, or to make it even worse for them? A night of rollicking farce and physical comedy that might just end up making you think. This is an evening you will not want to miss. These fantastic, young, musicians are destined for the top! Multi award-winning acoustic guitarist, Will McNicol, and drummer, Luke Selby, draw on influences from Brazilian sambas through to driving West-African rhythms and Celtic folk melodies to North American foot-stomping Blues numbers, to create music that will transport you across the globe, without having to leave your theatre seat! Since their formation as a duo in mid 2013, have been gaining rave reviews for their live performances up and down the country. Both highly respected and in-demand instrumentalists in their respective fields, the combination of Will’s intricate melodic fingerstyle playing on both steel and nylon string guitars and Luke’s explosive rhythms on kit and percussion has been making a unique impression. 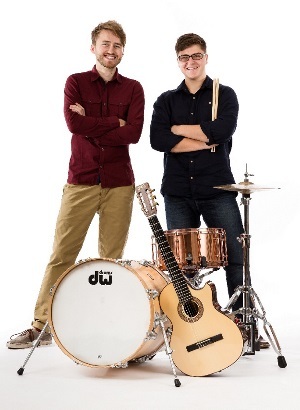 Will & Luke combine a worldwide diversity of musical influences with their own virtuosic instrumental ability and sensitive musicality to create an exhilarating live show, full of surprises which have gained them more than just a few standing ovations. Their passion for musical traditions from around the world has culminated in a collection of diverse original compositions, as well as reworkings of seminal works in a variety of genres, which have been released as their debut album "Hitchhiker". 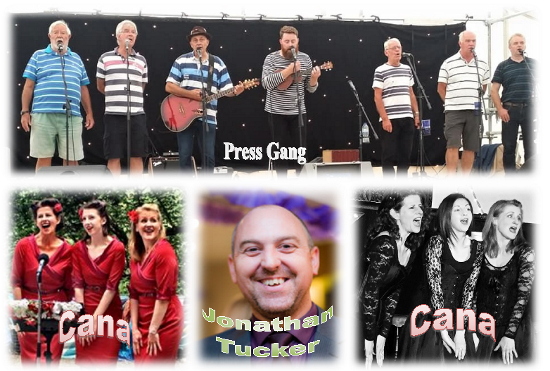 Press Gang has been performing to audiences with their harmonious singing since 2012. We specialise in entertaining our audiences with songs of the sea, songs about Cornwall, and a sprinkling of comedy numbers, all delivered with wit and enthusiasm. Our reputation has taken us to Festivals throughout the country, and a Flash Mob Video of us performing ‘Cornwall My Home’ at Gatwick Airport has been seen by well over 500,000 people! We were featured on BBC Spotlight when we performed on board the 'Phoenix' in Charlestown for the Poppy Appeal. We have sold some 1500 CDs. The Fowey branch of the RNLI receive £1.00 from each CD sale. We are about to record our 3rd CD featuring some of our new material. We are really looking forward to hosting tonight's show, raising money for our own funds which, in turn, enables us to perform at various charity events throughout Cornwall. Tonight, we line up with the fabulous Cana, who performed with NoteAbility at Holy Trinity Church in 2018. They were amazing! Cana are a classical trio with a laid back style. Their repertoire is a mix of opera favourites, hits from the musicals and close harmony songs from the 1940's and 50's. International singers, Caroline, Evie and Shelley are three Divas who are passionate about bringing the extraordinary sound of classical voices into more intimate venues. Their laid back performance style and top quality voices, alongside songs ranging from Puccini to the Andrews Sisters, will appeal to both opera lovers and those who have never heard the sound of opera up close and personal before. In addition to Cana, we are thrilled to have been able to get Jonathan Tucker to sing with us. We heard him sing recently at St Johns in St Austell and were blown away by his voice. He first started singing when he was 18 when he sang with Restormel Theatre Company. He has subsequently sung with a number of other theatre companies, playing various lead roles. You can expect him to sing songs from the shows with a huge amount of passion. You are going to love his voice..
Julian Dutton is an English comedy writer and performer, principally for television and radio, whose work has won a British Comedy Award, a BAFTA, and a Radio Academy Gold Award for Best Comedy. Julian has toured as a support act to Harry Hill and Al Murray. He is also know to many as the Secret Lemonade Drinker, in the famous tv commercials! In 2018, Julian wrote and performed a one-man stage tribute to the actor John Le Mesurier, "Do You Think That's Wise?" which he took to the Edinburgh Fringe festival in August and is now touring the UK, including a West End run in London in April & May, 2019. 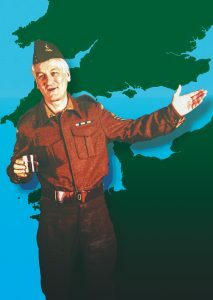 In his affectionate tribute to one of Britain’s best-loved comedy stars, Julian brings to life the man behind the wry smile and urbane English repartee that charmed millions and turned John Le Mesurier into a household name as Sergeant Wilson in Dad’s Army, one of the UK's most beloved situation comedies. As with many comedy stars, Le Mesurier’s life was not without tragedy – his broken marriage to Hattie Jacques, his betrayal by his best friend Tony Hancock – all these setbacks shook him, but his reputation as the quintessential English Gentleman never wavered. 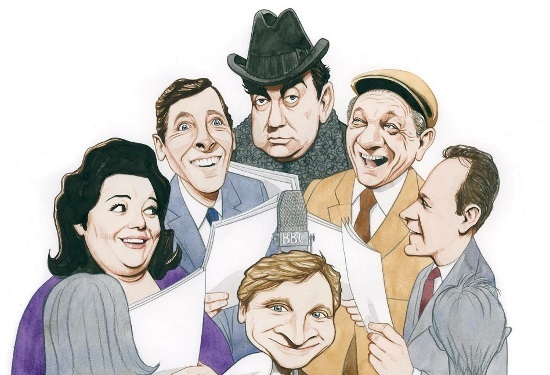 The show is packed with glorious reminiscences and stories from the Golden Age of Classic British Comedy. The show's title, Do You Think That's Wise, Sir? Is taken from Sergeant Wilson's tactful reply to any one of Captain Mainwaring's ridiculous suggestions. This humourous and touching one-man play reveals the pleasure and the pain of John Le Mesurier's life; the life of a self-styled “jobbing actor”, whose refined and cultured public persona concealed a personal life with more than its fair share of betrayal, heartbreak and sadness. Julian is the co-creator and co-writer of the BBC2 comedy series Pompidou starring Matt Lucas, the first visual comedy TV series to be made for almost twenty years, since Rowan Atkinson's Mr. Bean and which is currently showing in 192 countries on Netflix. Described as one of "the best vocal performers around," (BBC Comedy) he was one of the co-creators, main writers and performer on hit BBC One comedy show The Big Impression with Alistair McGowan and Ronni Ancona, and has also written and starred in several of his own series on BBC Radio 4, as well as writing extensively for many other TV and radio shows. Julian Dutton’s show is a joyful and moving celebrationof one of the most popular comic actors of our era. “You would think that John Le Mesurier was actually stood before you. “Julian Dutton’s impression is a wonder to behold” Lynn Bowles, BBC Radio. An evening that's sure to be Cool For Cats! 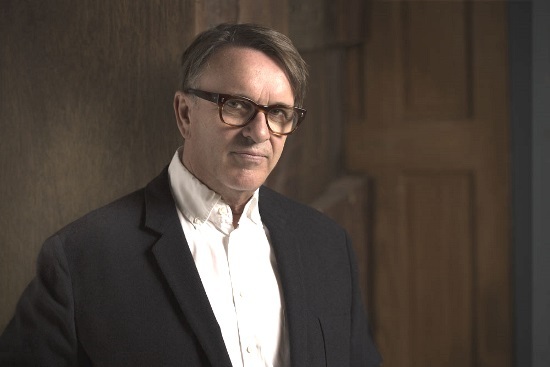 Chris Difford brings his ‘Up the Junction’ tour to the St Austell Arts Centre, providing a string of songs and stories from his incredible life on and off the road, with his band Squeeze. Chris is a rare breed. As a member of one of London’s best-loved bands, the Squeeze co-founder has with his collaborator, Glenn Tilbrook, very much “The Odd Couple”! Together they have made a lasting contribution to popular music with hits such as ‘Cool For Cats’, ‘Up The Junction’, ‘Labelled With Love’, ‘Hourglass’ and ‘Tempted’. Despite the fact that Chris has helped provide the soundtrack to so many fans’ lives since his first release in 1977, the passion for innovation and love of playing still drives him to carry on writing & performing, rather than sit back and admire his handiwork. Over the course of a 13 album (40 year!) career with Squeeze, it was clear from the very beginning that Chris Difford has few peers when it comes to smart, pithy lyricism. His street-savvy, witty & wise words and music Chris has drawn plaudits from fans on both sides of the Atlantic, with his influence and style still strong today today. Lily Allen and Mark Ronson, Kasabian, Razorlight and The Feeling have all recognised the debt they owe to Squeeze’s music and to Difford’s way with words, while journalists were moved by his winning combination with Glenn Tilbrook to dub the pair ‘The New Lennon and McCartney’. Chris first learned to stand on his own when he wrote the lyrics for the fictional band Strange Fruit in the 1998 British comedy film ‘Still Crazy’, for which he won his first Ivor Novello award. Since then he has written and contributed lyrics for the likes of Elton John, Wet Wet Wet, Jools Holland, Paul Carrack, Lisa Stansfield and Bryan Ferry. Don't miss your chance to spend an evening in the company of the Grammy nominated, double Ivor Novello award winner and one of the finest singer songwriters of our generation. Take him – he's yours! Click Here to Book Your EarlyBird Tickets before 1st July ! Shows on Thursday, Friday & Saturday! Tango in the Night is now in its 6th year, and though we don’t have the opportunity to gig that often, due to band member commitments, for 2019 we intend to do 4 at good sized venues. The band has evolved into the perfect Mac tribute, and all the main Mac characters are there, with the very welcome return of Esther Baker to the fold, she is literally the Stevie that Stevie Nicks would like to be and the reason I created the band in the first place! 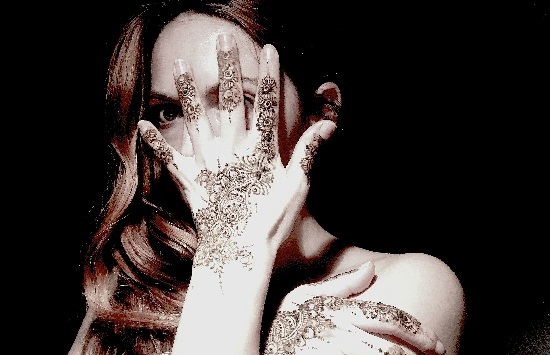 With a sublime vocal quality that cannot be surpassed, Esther woos with Dreams and Rocks with Gold Dust! Bob Seymour is very well known and respected throughout Cornwall as a stand out solo artiste, but he joins us as our Peter Green and vocally absolutely nails it He trades the blues guitar licks superbly with myself and also plays session guitar and backing vocals throughout the show. Amy Bellis . . . . . I didn’t know Amy from Adam, but when I saw her in a pub restaurant one evening looking so much like a young Christine McVie I actually went up to her and asked her if she sang and played keys?! And what do you know?! Same voice and same talent too! Amy is an original member of this band, and has a degree in music to boot! Steve Yendell is our John McVie and another original member who works tirelessly to emulate John's bass style and sound, he looks and plays the part so well! Steve has played in many bands in and around London and Sussex, and has been a London studio session player. Kev Dodd is our Main man Mick Fleetwood and a former decorated Royal Navy aircrew officer. His technical ability, style and feel and just plain enthusiasm for the drums is inspiring! It may well be his military background that provides his obsession with getting things just right, but whatever it is he’s obviously the perfect man for the job! Our two lovely backing singers Kim and Yvette were part of a fabulous vocal harmony quartet who recorded in our studio over ten years ago, and have years of experience in harmonising, and it shows! Ritchard Jones is our great percussionist and has performed with us many times before and is one of the very best around! I’m Kenny Barnes and responsible for this lovely bunch, and I play the role of Lindsey Buckingham. I trained at the RNCM and also run the studio. John on Sound and Caroline on Lights make sure the whole show looks and sounds great! Thanks Guys! If Laughter is the Best Medicine, the LPSO is just the tonic – they'll leave you in stitches! The London Philharmonic Skiffle Orchestra is a breath of fresh air. In a world where everyone is frightened to make a joke, for fear of offending someone, The LPSO is in no risk of offending anyone, except those with no sense of the ridiculous! 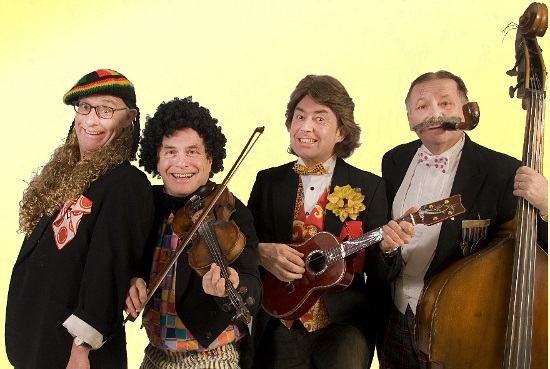 Maintaining the musical comedy tradition of Viv Stanshall, the Bonzo Dog Doodah Band, Spike Jones and his City Slickers and, in more recent times, The Old / New Rope String Band and the Ukulele Orchestra of Great Britain, The LPSOmeticulously blend virtuoso musical performances with anarchic, absurdist comedy. Their performances are colourful, bizarre, tuneful and hilarious, incorporating a wealth of instruments, costume changes, and numerous outlandish props. Most impressive is the group's seemingly endlesss energy and enjoyable enthusiasm to entertain and enchant. Their boundless exuberance and their skill and versatility of their musicianship drives the show forward and forward, and faster and faster, to a dafter and dafter comical climax, which will leave us all breathless with admiration. The LPSO come to the Arts Centre, for one night only, fresh from playing London's Union Chapel, as part of a star-studded bill including Ralph McTell, Chas and Dave, The Jive Aces, Chris Difford & Billy Bragg, in the show A Night For Lonnie Donnegan, honouring the UK's Skiffle King. As seen on Vernon Kay's "Five O'Clock Show"! Dolly Parton is enjoying quite some 2019. The 8-times Grammy Award winner, singer-songwriter made a show-stealing appearance at this year's Grammys, where she was honoured as the 2019 MusiCares Person of the Year. A revival of her show 9 to 5 has just opened to rave reviews in London's glittering West End and, later this year, an eight episode series entitled Dolly Parton's Heartstrings, based on the stories and inspirations behind Parton’s most beloved songs will premiere on Netflix. So, what better time is there to see a show based on the iconic Country music star's life and career? That is exactly what Hannah Richards' show The Dolly Parton Story does. This is no “tribute act”, but an affectionate and accurate look at Dolly Parton through good times and bad, performed in a ground-breaking format that takes its audience on an incredible journey through the highs and lows of Dolly's working and personal lives. 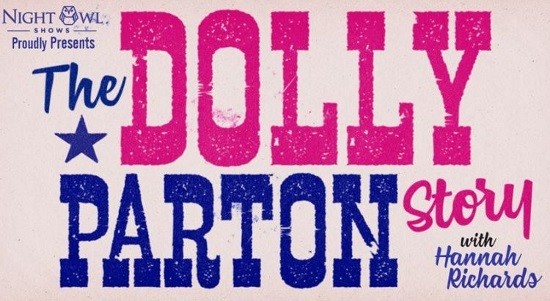 Featuring passionate and heart-felt renditions of Jolene, 9 to 5, Islands In The Stream, Here You Come Again, Coat Of Many Colours, Joshua and many more, The Dolly Parton Story enjoyed sell out shows with standing ovations at Edinburgh Fringe in 2018. Hannah sings the songs and tells the story of the “Queen of Country Music”, from her humble beginnings in the Smoky Mountains to her arrival as an international modern-day icon, idolised across generations, by men and women alike. Follow Dolly’s story from her childhood poverty, successful marriage, struggles in the music industry and making the cross-over from country to pop - this is a true rag to riches story that will leave you wanting more. 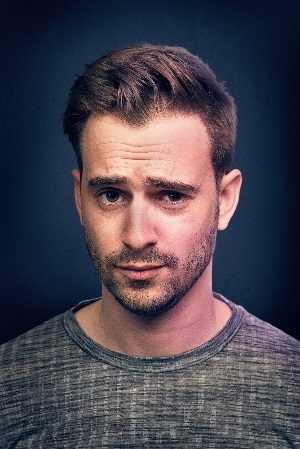 Since his hilarious tour-de-force performance of his one-man show The Only Way is Downton, at the Arts Centre back in 2014, Luke Kempner has become one of the UK's leading comedy impressionists, with an ever increasing cv of appearances on the top tv and radio comedy shows. 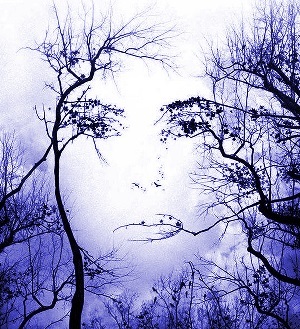 Luke returns to the Arts Centre this year with his latest show “House of Faces”. You can expect top-notch comedy and impressions from Luke that even the stars he impersonates can't belive how accurate his versions of them are! After 4 years in the West End with Les Miserables, Avenue Q and South Pacific, Luke garnered global attention in 2012 with his hit viral video Downstairs At Downton. Since then, Luke has gone from strength to strength, taking his one man show The Only Way Is Downton to theatres and festivals across the UK and U.S.A.
2018 saw Luke return to the Edinburgh Fringe for a sell-out run of his 4th show House Of Faces which he is touring the UK with this year. Alongside his live work, Luke has a burgeoning television and radio career. He created and starred in his own review show for ITV2, entitled Luke Kempner’s Impression of 2015. Luke is a regular on BBC Radio 4’s institution The Now Show and News Jack. A regular on BAFTA winning Murder In Successville. He was the breakout star of The Imitation Game on ITV last year and finished the year appearing on the Royal Variety Performance. In the Summer of 2016, Luke became the resident comedian on Celebrity Big Brother’s Bit On The Side, he filmed 9 series and has been hailed “a blumin’ genius!” by Dawn French. If you want to cite influences, you could credit Mike Oldfield, Kate Bush, Laurie Anderson, Michael Nyman, but the fact is The Blackheart Orchestra is unique, with a sound and style all of its own. Award-winning British songwriters, composers and multi-instrumentalists, Chrissy Mostyn and Rick Pilkington are The Blackheart Orchestra. The pioneering duo blend musical styles seamlessly sidestepping boundaries to create music huge enough to fill a cathedral. Well known for producing music beyond all easily marketed genres, their multi-instrumental sonic landscapes have always been too unpredictable for pop, too adventurous for the mainstream and too plain weird for folk. Fusing acoustic fragility and pulsing electronica, The Blackheart Orchestra bring together stringed instruments with '80s synthesisers and classical influences. Often mistaken for an 8-piece band on first listen, their stage has been described as a ‘musical spaceship’ where they are to be found continuously changing from electric and acoustic guitars, bowed guitar, piano, organ, bass and electronic percussion to vintage synthesisers, omnichord and melodica in a complex choreographed weave of musical moods and textures. One moment their sound is minimal and molecular, the next a mountain-like wall of sound with vast symphonic climaxes. A treat for the eyes as well as the ears: to witness two people become an “orchestra”; seemlessly, almost invisibly, switching vocals and instruments between them is as mesmeric to watch as their music is hypnotic to hear. Their four critically acclaimed albums and mesmerising live shows have won them obsessive worldwide fans, plaudits from musical giants and placements on TV commercials and films. Chrissy Mostyn’s haunting vocals, the multi-instrumental playing of Rick Pilkington, plus their fearless combination of conventional and unconventional all reflect their self-created universe where art meets sound and words paint pictures that take you with them on their deep musical journey into the human psyche. Following James Hurn’s sell out tour of 2018, he’s back with his popular One Man-Many Voices celebration of the radio comedy classic, Hancock’s Half Hour. James, a multi-talented actor and impressionist, will be performing a Brand New programme of Hancock & Co. which includes a lost episode of Hancock’s Half Hour and two new episodes he has written himself, with James voicing the entire cast. The show is presented in the style of a radio performance in front of a live audience. James has an incredible ability to mimic some of the gods of British comedy, but also their timing, style and souls too – Tony Hancock, Sidney James, Hattie Jacques, Kenneth Williams, Hugh Lloyd and John Le Mesurier are all astounding!